I had four delicious posts lined up for you but I couldn’t decide which one I wanted to post. I thought about posting some popsicles that I made inspired by The Slow Roasted Italian, but I thought I’d wait until it gets into those muggy summer months. I asked my followers on Facebook (hit the “Like” button in the sidebar if you haven’t already =P), and from the feedback, people wanted these delicious Vietnamese vegetarian steamed rice rolls. Typically, these are stuffed with a ground pork mixture (basically substitute the tofu for the ground pork), and topped with fried onions and complemented with lots of leafy greens like green leaf lettuce, steamed bean sprouts, cucumbers, mint, cilantro and whatever other greens my grandpa has in his garden. Drizzle from Vietnamese fish sauce on top, and these rolls are my absolute favourite thing to eat. As many of you know now, I am vegetarian and I can’t eat any of that anymore. I thought I wouldn’t be able to eat this ever again, but my mom proved me wrong. One day, she woke up early and made me these before she went to work and took my brother to school (seriously, my mom is Super Woman). It was a huge platter of about 40 rolls and I was ecstatic. I had some vegetarian dipping sauce to drizzle on top and everything was perfect. As a result, I wanted to learn how to make these so that I could show you lovely readers how to make these fantastic Vietnamese vegetarian steamed rice rolls. So for Mother’s Day, my mom, my grandmother, and I all gathered in the kitchen to school me in the art of making banh cuon. My mom did it two at a time and was a BEAST at mastering the rhythm (with what I imagined included years of practice and experience) and after she showed me how to do it once, I just dove in. I seemed to get the rhythm down pretty quickly, but honestly, the most difficult part was flipping the rice crepes over flat. They kept flipping all to one side so it was a little pile of rice crepe, which is super sticky and refused to come apart (kind of like bunched cellophane). The bottom of the crepe (which becomes the outside of the rolls) is smooth and oily, while the top part of the crepe is bubbly and crispy (which becomes the inside of the rolls). The mixture of textures from the filling, the smooth chewiness of the rice crepes, the crunchy fried onions, and the fresh greens is honestly the best thing ever. Oh man. Being Vietnamese is awesome. - To serve, garnish with chopped cucumber, steamed bean sprouts, mint leaves, lettuce, and fried onions with vietnamese dipping sauce. Prepare the filling first by soaking glass noodles in hot water for 10 minutes. Once they're pliable/soft, drain and use scissors to cut into 1 cm pieces. Set aside. Soak the cloud ear fungus in warm water until soft. Slice into small slivers and set aside for cooking. In a large pan over medium heat, stir-fry the onion and carrots with olive oil for 3-4 minutes until the onions are getting translucent. 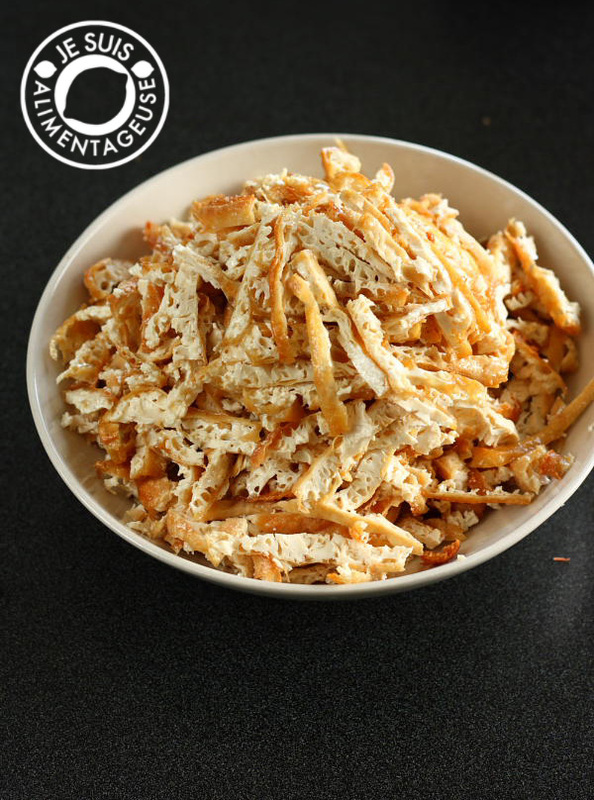 Add the chopped noodles, sliced fungus and about 1/2 tsp salt and continue cooking, stirring continuously for about 5-7 minutes (the noodles will get softer and absorb the moisture from the cooking process. Add the chopped tofu and another dash of salt. Continue until everything is cooked through, then remove from heat and set aside. Preheat a small, non-stick pan over medium high heat and pour one ladle-full of batter (make sure you stir before pouring) onto the pan. Cover with a lid and cook for about 1 minute. Take the lid off the pan and continue to cook for another minute. Flip the crepe onto a cutting board/plate and fill the crepe with the filling. Tuck in edges then roll to wrap the filling. Transfer to a platter. Repeat until all ingredients are gone. If you want to do the 2 pan process that my family taught me, see the notes below. Serve with vietnamese dipping sauce and the greens mentioned in the ingredients list. My family's "rhythm process". Heat two small non-stick pans on medium high and keep the rice crepe batter with a ladle beside the stove. Also set up a plate or cutting board for you to fill and wrap the crepes (I recommend wearing vinyl gloves if you don't think your hands can handle hot crepes). Keep the filling you just cooked next to the plate/cutting board for quick access. Stir the batter well to mix the settled rice flour. Pour a ladle-full into preheated pan #1 and cover with a lid. Let cook for about 1 minute, then remove the lid (keep on heat). Now pour a ladle-full into pan #2 and cover with the lid that you took off pan #1. Flip pan #1 over onto the cutting board/plate and pour another ladle-full onto pan #1 and take the lid from pan #2 and cover pan #1. Now take a spoonful of the filling and place in a strip in the middle of the crepe (on the crispy side). Tuck in the edges then roll to keep the filling inside. Move to a plate and then flip the crepe from pan #2 onto the cutting board (the crispy side will be facing up). Fill pan #2 with batter (make sure you stir before pouring) and take the lid from pan #1 and put it on #2. Fill the crepe and repeat the process! 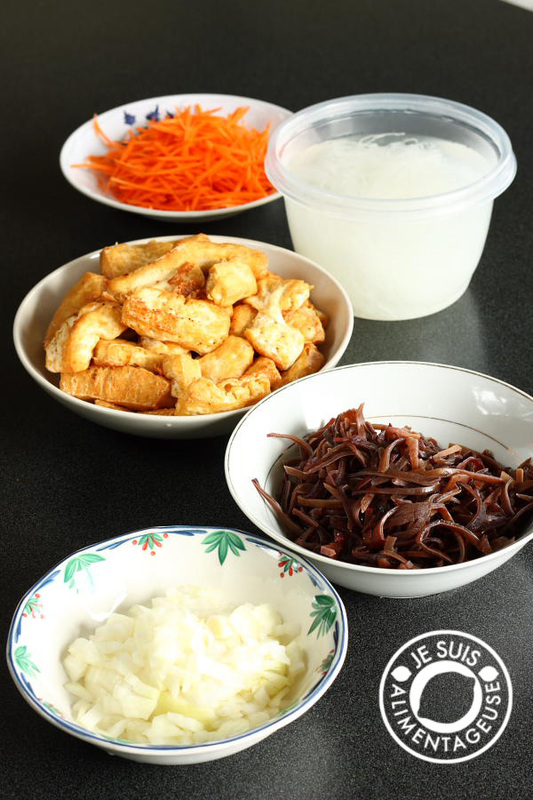 It sounds complicated but once you do it, you just get into a rhythm and before you know it, you're out of ingredients and you've got like 2 platters of rice rolls! This looks great but I do it with shredded cabbage too. This may sound like a silly question...but can we use the same wrappers as the spring rolls instead...or is that too thin? Hi Kira, perhaps you could but it would be a different dish entirely. I also recommend using some more bulky/starchy ingredients in the mix if you were to turn these into fried spring rolls like grated potato or taro. 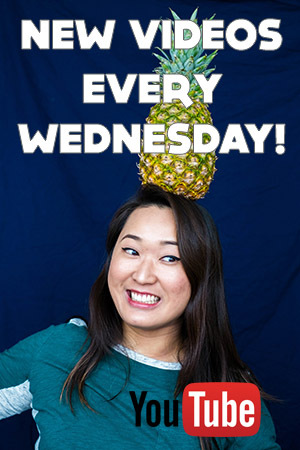 I think this might be my new favorite blog :) I love Vietnamese food so much and enjoy trying to learn my way around different dishes in my own kitchen! But I recently became a vegetarian and there is meat in so so many Viet dishes. I love tofu, and of course sometimes meat can just be left out, but there are times I wonder how to modify a Viet dish to my new eating habits. I was looking online for this dish specifically and am so excited to try making my own rice crepes. Yay! Thank you! I'm so glad! Thanks for leaving a comment and I hope it works well for you! I'm so glad! I tend to make "deconstructed" rolls with those lumpy disasters because as long as you add the filling, some veggies and the dipping sauce/dressing, it tastes just as good! So glad I came across this. My mom made some a couple of weeks ago and I totally forgot how much I love them! Hoping to see if she'll do one with the fried tofu for me next time while I master this whole crepe making thing. My mom does the two pan process as well! no freaking way!! 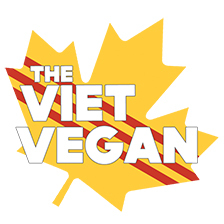 i am so glad i found this website as i am a vietnamese vegan, as well! WHAAAAAAAAT! I have never met another Viet vegan. You're awesome. If you use Fish Sauce, then it IS NOT Vegan. Just like Worcestershire sauce IS Not Vegan because it is made with anchovies. So please do not call this vegan if you are gong to suggest using the Fish Sauce! Hi Linda! If you actually read the post you could see that I have a vegetarian version of the traditional fish sauce. As someone who is Vietnamese, I like to educate my readers not only about vegan food but also Vietnamese culture, and I think it's important to explain to people who may never have experienced Vietnamese food before that fish sauce is quite abundant in Vietnamese cuisine. Since I am now vegan (Recipes on my blog prior to fall 2013 have non-vegan recipes because that's when I transitioned to veganism), I strive to find alternatives and methods to cooking Vietnamese food that is vegan and mimics the traditional flavours of Viet cuisine. 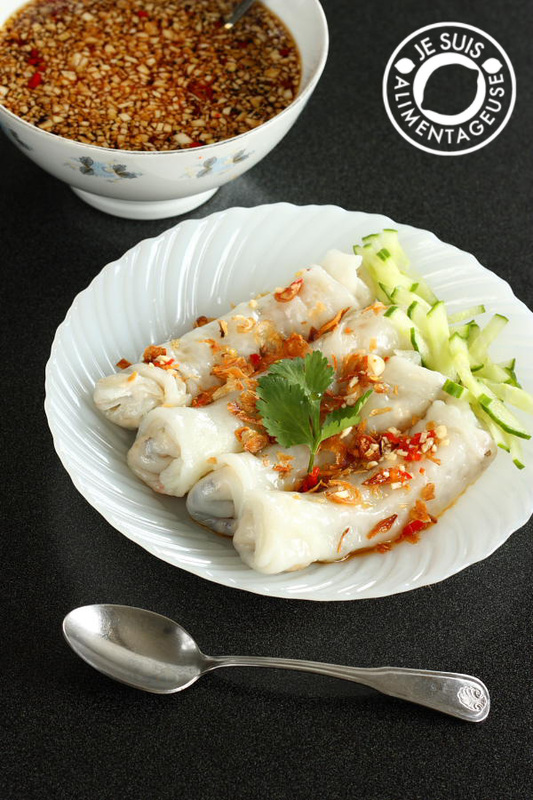 I am having trouble finding the recipe for Banh Cuon – Vietnamese Vegetarian Steamed Rice Rolls. I see the picture and read the story about mothers day. (delightful story by the way) but i am unable to see the actual recipe.